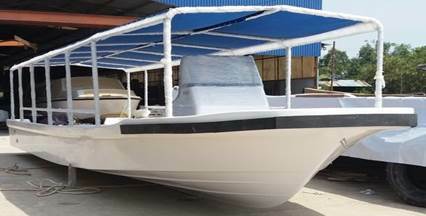 W36-HD Hull, 36 FT (10.98 m) Fiber glass with Stainless Steel Hardware. THIS SOLID UNSINKABLE, 36 FOOT (10.98 MTRS) FIBREGLASS CENTRE CONSOLE IS COUPLED WITH 2 COMMERCIAL RATED YAMAHA 200HP. THIS IS A VERY VERSITILE, FAST, ECONOMICAL AND RELIABLE NEW VESSEL. · OR JUST PERSONAL USE. IT’S CARRYING CAPACITY IS OVER 4 TONS AT 25 KNOTS, USING APPROX 65LETRES AN HOUR. FUEL RANGE IS OVER 100 NAUTICAL MILES.